The persistent zest of all organizations is to increase efficiency while maintaining quality, and machine learning as a service has emerged as a tool that can leverage cloud computing services to aid in data visualization, application program interface (API), natural language processing (NLP), face recognition, deep leaning, and predictive analytics. 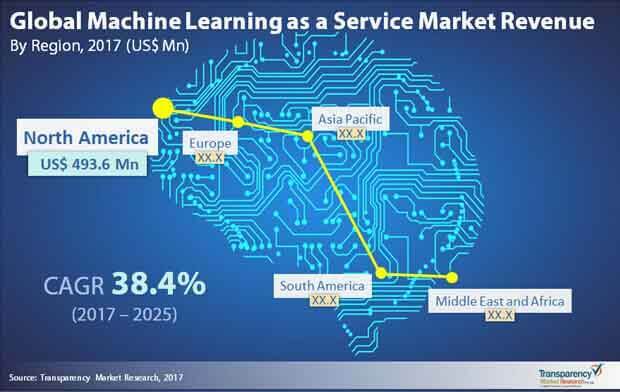 This zest is turning into a boon for the global machine learning as a service (MLaaS) market, in which the demand will be incrementing at an exuberant CAGR of 38.40% during the forecast period of 2017 to 2025, according to an up to date business publication released by Transparency Market Research (TMR). Revenue-wise, the global MLaaS market is estimated to be worth US$19.86 billion by the end of 2025. The analyst of the TMR publication has notified for a fairly consolidated competitive landscape in the global machine learning as a service market, with leading three companies, viz. Microsoft Corporation, Amazon Web Services, and IBM Corporation collectively held more than 73% of the total shares as of 2016. This being said, a number of regional players have mushroomed in the recent past and the future competitive landscape is expected to be much more fragmented, although the aforementioned three prominent players will continue to dominate in some sense. This prominence of Amazon, Microsoft, and IBM can be attributed to their vast geographical presence and the ability to provide for efficient services if not innovate for new products. These players are also financially equipped to collaborate with or acquire small players in order to maintain their stronghold. As a result, the opening for new players is to carve niche technologies and tools and attract a support from the giants and create a brand name overnight. Some of the other notable players active in the MLaaS market are Google Inc., FICO, Sift Science Inc., Big MI Inc., Yottamine Analytics, Hewlett Packard Enterprise, Fuzzy.ai, Datoin, Predictron Labs Ltd., and H20.ai. Based on deployment type, the TMR report segments the MLaaS market into private and public cloud, whereas end users studied for their demand potential are retail, manufacturing, telecom, healthcare and life sciences, and banking, financial services, and insurance (BFSI). Region-wise, North America has been highlighted as the one generating the greatest chunk of demand, although Asia Pacific is primed to excel at an above average growth rate. Apart from the growing adoption of cloud-based technologies by small and medium businesses (SMBs), the desire to understand each individual independently and serve accordingly is further augmenting the demand in the global machine learning as a service market. With an ability to bifurcate different customers, the vendors are able to offer personalized services and develop a brand name for themselves. The market for MLaaS is also expected to gain traction from emerging application possibilities with technological advancements, increased investment across the healthcare industry, and increase in data from IoT platforms. On the other hand, compliance issues, governmental regulations, and strong lack of skilled consultants are some of the restraints curtailing the progress of this market.